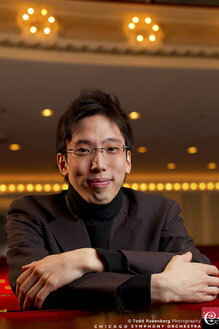 A Tokyo native, Shoichi Sean Kubota was chosen out of 225 applicants from 40 countries on five continents as the winner of the Chicago Symphony Orchestra’s (CSO) First International Sir Georg Solti Conducting Competition and Apprenticeship in 2011 and subsequently served as CSO’s conducting fellow under the direction of its Music Director, Riccardo Muti. Mr.Kubota has conducted numerous premier ensembles throughout the world including Milwaukee Symphony Orchestra, Civic Orchestra of Chicago, Melbourne Symphony Orchestra, Orchestra of Sofia, Orchestra della Toscana, PMF Orchestra(Sapporo), and Spring Festival in Tokyo Ensemble. His guest conducting mentors have included Hugh Wolff, Marin Alsop, Leonard Slatkin and Kurt Masur. During his tenure with the Chicago Symphony Orchestra, Mr.Kubota had the opportunity to work closely with distinguished conductors such as Riccardo Muti, Bernard Haitink, Charles Dutoit and Edo de Waart on more than 30 programs and accompanied them on their domestic as well as international tours. In the 2012-13 season, he coached musicians of the Civic Orchestra of Chicago as part of CSO’s River Project with the famed cellist, Yo-Yo Ma, serving as its producer. As part of the program, Mr. Kubota made his Chicago debut conducting Beethoven's 6th Symphony to a packed house, which resulted in a standing ovation. he produced a ‘side-by-side’ concert in which professional musicians and local high school students joined forces to perform Joe Hisaishi's film compositions as part of an effort to introduce and spread awareness of the Japanese culture. Orchestrada, an orchestra based in Tokyo that Mr. Kubota serves as music director, regularly invites and in its relatively short history already has brought to its performances more than five hundred individuals who are blind, disabled, ill or otherwise usually unable to attend such concerts. He hopes to continue building relationships with welfare facilities in Tokyo to find various ways to present music to a wider demographic.